A few years ago when I wrote a weekly newspaper column (“Life, Literature & the Arts”), I penned a piece for my dad on what would have been his 60th birthday, which you can read below. Having passed away a few months before, my dad never made it to this milestone. There was an accompanying video from 2009 — of me actually eating a sardine for the first time, thus inspiring this little story — which I had planned to embed, but apparently, it has disappeared from my hard drive along with about every other video from that year. Today, October 26, 2012, would have been my dad’s 63rd. While I don’t celebrate the anniversary of my dad’s death for my own personal reasons, I do still celebrate the anniversary of his birth back in 1949. I am thankful for my dad each and every day. Without his birth, I would not have been born. Without my birth, my daughter, Annabelle, would not have been born; and she, without a doubt, is the greatest gift my father could have ever given me. Hats off to you mustachioed man. With the pull of the aluminum tab, there they were. Much larger than I remembered. Without eyes. Their heads and gills diced off. The overhead light met their sterling silver skin. The quarry of the sea for bonito, tuna, and others, my fork entered the flesh of the sardine and I raised it to my mouth. As it drew closer, I expected a fishier odor but instead was pleasantly met with the efflux of tuna. And I love tuna. My face scrunched still, my fork found its way to my mouth and in the sardine went, filling in the pits of my back teeth. Thick with oil and gritty also, the sardine nearly dissolved in my mouth as I began chewing. I was completely caught off guard by the amiable taste. “They’re actually pretty good,” I said to my wife. Sardines. A cupboard staple in my home growing up. My dad loved them. Not as much as fried chicken. Not as much as chocolate ice cream. But pretty close. “Try one. I bet you’ll like them,” my dad used to say to me, pulling the aluminum tab of the can back. I always shook my head no. He never did convince me to sample a sardine and here I was now eating one by my own choosing, on my own free will. A giant step for man. A giant leap for mankind. On Sunday, Allison and I went grocery shopping. As we passed down one of the aisles, I noticed the sardines lined up on the shelf. I’ve never thought twice about buying a can of sardines in my life. Never noticed them passing by. Smiling, I said to my wife, “I’d like to try a sardine on my dad’s birthday” alluding to Monday, October 26, when my dad would have celebrated his 60th birthday. Allison smiled in return, nodding her head in agreement. I placed the can of Cole’s sardines in the cart, looking down again at the box: “Caught by local boats off northern Portugal, these delicious sardines are sealed in pure olive oil,” the box read. You’d think I was going to jump out an airplane at 10,000 feet or go bungee jumping. Maybe even pet a lion on the southern plains of the Serengeti. Something more radical and daring instead, eating my first sardine. Considering that I ate frog legs religiously as a kid, I am not quite sure why sardines wigged me out so. My lifelong refusal of becoming my dad’s personal sardine convert should have come as no surprise to him. He had a taste for peculiar delicacies; I surmise you could call them that. After all, one of my earliest memories of my dad is of him standing at the kitchen sink with a peeling knife in his hand. He lifted me to the counter top and sat me down. Two large faint white meatballs sat in the sink like fleshy chicken eggs which slipped in and out of his hand like a wet bar of soap. He ran lukewarm water over them and then began peeling the skin off the meatballs. Except they were not meatballs. They were cow testicles. M is for Moo. Moo cow. I was young. Moo cow is all I could think of when I saw these large bull testicles in the sink, glistening. Even at that age, my groin hurt. To this day, I think this moment in my childhood is why I am not a huge beef fan. I’m more of a chicken kind of guy. 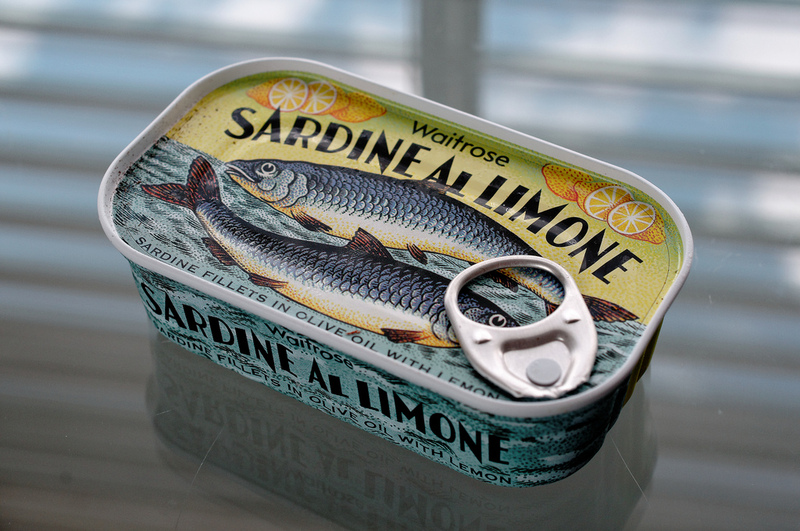 As I ate my first sardine today, the smell sent me back twenty plus years. “I bet you’ll like them,” he had said to me then. He was right. I love you so much I’m eating sardines. Sardines are good. I like them drained of the oil and covered in vinegar. This is a good article. I too find I do things my Dad ( your Poppa) used to do…I watch Hee Haw, like Red Skelton, Porter Wagon and eat fried oysters. My Dad loved them stewed, but can’t quite acquire that taste, yet.